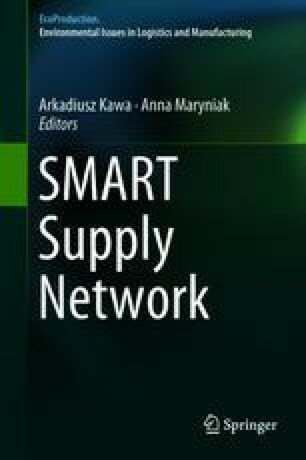 A smart supply network must be immune against the situations like losing the goods during the transportation process. Such losses may raise the necessity of increasing the number of deliveries and thus the use of fuel and pollution. The importance of this problem has been proved by the results of a quantitative research performed among Polish companies. A solution to this problem is to design a smart supply network with appropriate DSS (decision support system), based on relevant mathematical models and algorithms, that allow to reduce the number of multiple deliveries. The paper was written with financial support from the National Center of Science (Narodowe Centrum Nauki)—the grant no. DEC-2014/13/B/HS4/01552. Balachandran, V., & Thompson, G.L. (1974). A note on Computational simplifications in solving generalized transportation problems, by Glover and Klingman. Discussion Papers 66, Northwestern University, Center for Mathematical Studies in Economics and Management Science, http://www.kellogg.northwestern.edu/research/math/papers/66.pdf. Cited 28 July 2015.